Every pet deserves a day at the spa, and Georgia’s got plenty of pet groomers to deliver the royal treatment. From puppy pedicures to spa-like baths, your pampered pets will feel great, look wonderful, and love you for taking care of them. Book your pet a mini getaway at these 10 best pet groomers in Georgia! The folks here truly love all creatures great and small and put your pet’s safety at their top priority. 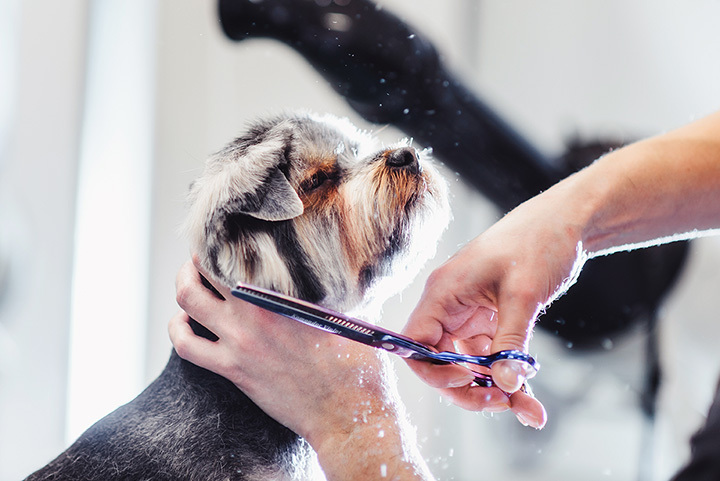 Their methods are a bit different than what you’d find at most pet groomers: no hot dryers, no harmful pesticides or chemicals, and lots of one on one attention. In addition to salon services, they also offer boarding services that keep your pet happy and engaged while you’re away. This charming little pet boutique will make your pet think he struck the jackpot! Self-service dog wash stations, complimentary treats, and full-service grooming gives every pup the day they deserve. While you’re there, you can scoop up a new toy, collar, or other gift for your fur baby at their chic shop. More like a luxury getaway, you won’t find a better place to help your four-legged friends feel great. Posh amenities like an in-ground swimming pool, play yard, and blueberry facials might make your pet want to stay and play awhile! They also offer top-notch boarding and daycare services to give your pet the next best thing to being home with you. The attention to detail from the staff is unmatched! They treat every pet as if it were their own, helping them to feel right at home during their stay. They’re experienced in working with dogs of many breeds, especially larger dogs that take more time. Two Atlanta locations makes it easy to take your pet to the best groomer in the city. In addition to salon services, they also offer boarding and daycare to take care of your pet while you’re away from home. They’re also the city’s top choice for all-natural pet food and supplies to keep your pet feeling his best. This chic pet grooming salon might make you a little jealous they only work on animals! With 20 years of service, this award-winning pet salon provides luxury grooming services for dogs of all sizes. From high-end shampoos tailored for your pet’s unique coat to nail trims to brush-outs to breed-specific styles and more, your pet will come home feeling refreshed and excited to go back for more! The folks here know how to make your pet happy, even if they’re the anxious type. Serving the area for over a decade and counting, they love each of their furry customers as much as they love their own pets. If you’re coming here for boarding, you can rest easy knowing your pet has plenty of room to run and play. Flea treatments, trims, styles, baths, teeth cleanings—this place does it all! They work with dogs and cats of all sizes, giving you a single source for your pet’s care. They also have some of the most competitive rates in town! Boarding, daycare, and grooming, this place offers the trifecta of pet care. You can drop off your pet to be pampered and give them the day to play for one low price. They’re the biggest dog and cat grooming salon in the area, so there’s plenty of staff to accommodate your schedule and all the service you need to care for your pet. More than just a cutesy name, the groomers here are true professionals. They love pets and give your pooch the love and attention they deserve. Pets get excited to come here and always leave looking fresh and clean.